Get Your My Lil Lion Cat Treats and Other Bulk Pet Snacks at Blair Candy! Recently, we at Blair Candy added a bunch of adorable dog and cat treats to our inventory, not wanting to exclude our furry pet friends from the joy of a good sweet now and then. Now your dogs and cats can settle down with some snacks just the same as you! 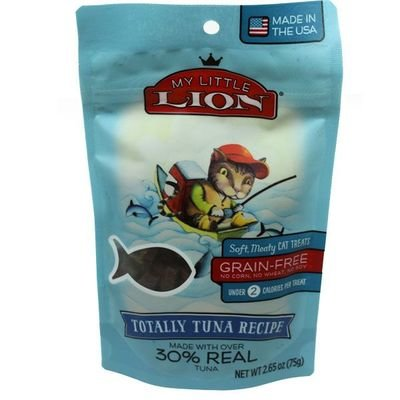 My Lil Lion cat treats are big with cats, especially seeing as they come in flavors that include tuna, codfish, and salmon, all favorites of the typical housecat. Your kitty will also love our varieties of PureBites cat treats, which are available in whitefish, shrimp, and beef liver flavors. We didn’t forget about your canines! For all those pet dogs out there, Blair Candy carries a ton of dog bones from our local bakery Poocheychef! Flavors of these dog bones include peanut butter, yogurt, bacon, oats and apple, and pumpkin. You can also get your dog Poocheychef bacon strips and chicken jerky treats, all tasty little snacks that he or she is sure to love. If you’re looking for bulk dog and cat treats, Blair Candy is now the place to go! 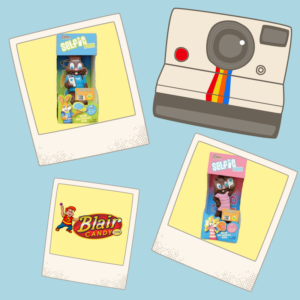 We’ve got even more than we’ve written about here, so we encourage you to go to BlairCandy.com and check out our entire pet treat inventory right now. We’re a wholesale candy retailer happy to serve both humans and pets! Twilight Vegan Candy Bar: A layer of thick caramel on top of a fluffy chocolate nougat, covered in delicious rice milk chocolate coating in this Milky Way-like choice. Mahalo Vegan Candy Bar: Sweet coconut and almonds wrapped in luscious chocolate. What could be better than this Almond Joy-like treat? Thumbs Up Vegan Candy Bar: A Butterfinger-like alternative, this bar has a crunchy peanut butter filling coated by delicious rice milk chocolate. Jokerz Vegan Candy Bar: Crunchy peanuts, caramel, and nougat blend together perfectly before being enrobed in a creamy rice milk chocolate coating in this Snickers-like candy. Which one are you eager to try first? We can’t choose only one to give a taste! Have Even More Fun with Gummy Candy in Bulk! From classic and sour to unusual and fruity, we carry a wide selection of gummy candy in bulk so you can ensure the fun never runs out! Classic Gummies: Gummy bears, Swedish Fish, and gumdrops are longtime gummy favorites. Satisfy adults and children alike with our selection of classic gummy candies available in bulk sizes. Sour Gummies: Looking for a twist on the classic gummy varieties? Check out our selection of bulk sour cherry cola bottles, sour rolled belts, sour peach slices, and more! Unusual Gummies: Surprise and delight with gummies shaped like Ju Ju coins, Mexican hats, and worms. Whether you need candy for a theme party or just for fun, these gummies in unusual shapes will be a hit! Fruity Gummies: Not to be mistaken – or used as a replacement – for the real thing, fruity gummies offer a fun candy experience inspired by nature! With raspberry, watermelon, strawberry, cherry, and more fruit flavors available in bulk, your customers or party guests can mix and match their favorites to create their own unique blend. 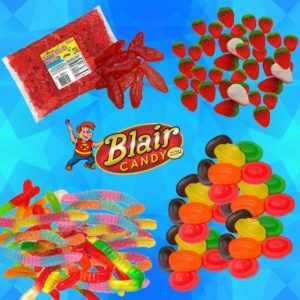 There’s much more gummy candy in bulk to be found at BlairCandy.com, visit us to order your favorites! Summertime means little league baseball games and time spent at the concession stand. If you volunteer for your child’s little league team and are looking to add a sweet treat to your concessions menu, consider buying chewing gum in bulk from Blair Candy. Chewing gum has long been a baseball favorite and when you’re looking to surprise your little sluggers with a post-game treat, there’s nothing more fun than bubble gum! 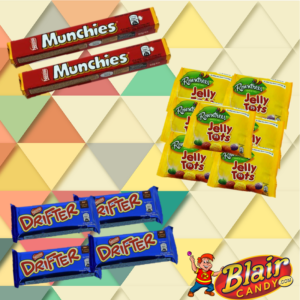 At Blair Candy, we stock a variety of fun flavors to suit anyone’s preference. For classic candy lovers, you’ll find pink bubble gums from Dubble Bubble, Super Bubble, Bubblicious, and other great brands. For those who want something a bit more adventurous or out of the ordinary, try our Fortune Bubble Gum, Cotton Candy Dubble Bubble, or one of the sour bubble gums in our inventory that are sure to make you pucker! 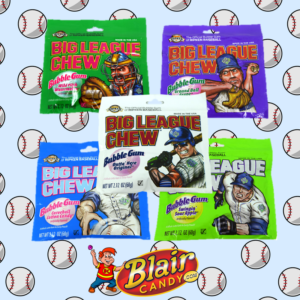 And for those superstars on your team, we carry a full selection of Big League Chew in a variety of flavors – a ballpark essential that’s sure to be a home run for kids and parents alike! Purchasing chewing gum in bulk will help your league save on concession costs, plus it makes it easy to keep your stand well-stocked all season long! Jolly Rancher candy has been a staple in many consumers candy jars for years! Switch things up with a new Jolly Ranchers flavor with one of these new packages of hard candy. 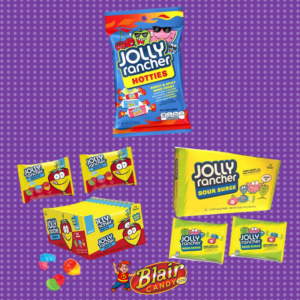 Like always, Blair Candy is always adding new candies to their “Just Arrived” page and there are three new Jolly Rancher candies that we think you’ll love. First, hot and spicy candy is a new trend for confectionary treats in 2018. Jolly Rancher has hopped on the bandwagon and has added a kick to their iconic flavors. Try flavors like watermelon cayenne, blue raspberry sriracha, cherry habanero, and green apple ginger. Next, if you aren’t looking for spicy but like sour candies, these Jolly Ranchers should be in your next candy order. Each of these hard candies has a sour powder center, making them extra sour. Plus, these are in individual bags perfect for party favors and lunchbox snacks. Finally, if you’ve always wanted a gummy candy in your favorite Jolly Rancher flavors, look no further. These gummy Jolly Ranchers have two flavors in one gummy, making for delicious candy combinations. These are also in individual packages, so these are also perfect as a concession candy, party candy, or as a lunchbox treat. Shop these and other bulk Jolly Ranchers today at BlairCandy.com! New European Candy Bars at BlairCandy.com! Rowntree Jelly Tots: These little drops of jelly candy are something the whole family will love! The packages pictured come in a box that has 36 single sized bags, making it great for lunches or on the go snacking. Flavors in these bags are blackcurrant, strawberry, lemon, lime, and orange. What’s even better is there are no artificial flavors or colors, so there is a little less guilt when it comes to these delicious gummies! Drifter Candy Bars: How does a Kit Kat and a Twix Bar rolled into one sound? Pretty good! These candy bars have a wafer biscuit, caramel, and chocolate in every bar. Every chocoholic will enjoy this flavorful, highly textured candy bar. Munchies Bar: Similar to Rolo candies, this chocolate bar has a soft caramel and crisp biscuit center, all covered by a nice layer of milk chocolate. This candy bar also has no artificial colors, flavor, or preservatives, so you get nothing but delicious ingredients in every bite. There’s plenty of other European candy bars to try at BlairCandy.com! Take a trip without leaving home and try a few of these scrumptious treats today! Spring is a great time to enjoy candy, but if you’re on a sugar-free diet or need to be mindful of sweets, it can feel like a challenge! 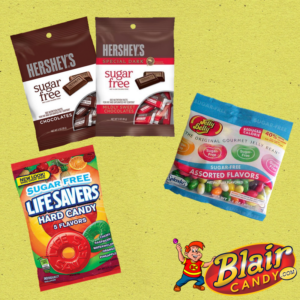 To make enjoying your favorite treats easier, Blair Candy carries a variety of sugar free candy to suit anyone’s preferences for hard candies, chocolates, and more! For those chocoholics on our list, we’ve got Asher’s sugar free chocolates in pecan patties, peppermint patties, and peanut butter cups. So delicious! Need to bake sugar-free for the holidays? We also have Hersey’s sugar free chocolate chips and chocolate bars in our selection. Maybe you are feeling extra nostalgic this season. If so, reach for root beer barrels, butterscotch hard candies, or cinnamon hard candies – all sugar-free – from our candy inventory. Love fruit flavors? 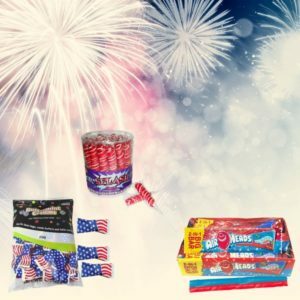 Then you’ll adore the sugar-free fruit chews and fruit hard candy in our selection. They make perfect additions to your candy dish when entertaining. Or, if you prefer something gummy, you can find sugar free varieties of peach rings, gummy bears, and gummy fish. For guests in your home, at church, or at another spring gathering, you can also put out a bowl of sugar-free mint hard candies, like Sugar Free Life Savers or Brach’s Starlight Peppermints. A fresh mint can be the perfect way to top off your dinner. 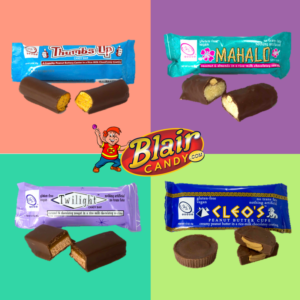 No matter how you choose to celebrate the season with candy, know that Blair Candy has the best selection of sugar-free delights for friends and family! Check Out these New Easter Bunnies! Every Easter basket should have a chocolate bunny! Everyone loves to find these friendly little treats and usually save them for last when eating their candy. 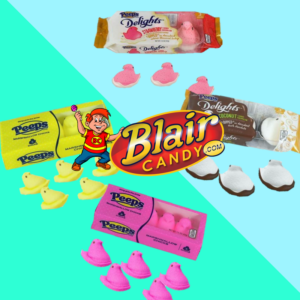 If you think that you need to change it up from the classic chocolate bunny, Blair Candy has plenty of choices to do so. Whether you eat the ears first or break it apart, here are three new bunnies that everyone will love! Easter Bunnies can be mischievous and this bunny shows it! Hoppy’s Hideout has a silly bunny hiding crispy, chocolate carrots in a tree. Kids and adults will find this bunny adorable, so make sure you have one hidden in every basket! Finally, if you have a basket to fill with Reese’s candy, this bunny has to be a part of it. These Reese’s Giant Bunnies are 1lb of delicious, chocolate and peanut butter filling. There will be no issue breaking apart this bunny! Check out all of our classic and new bunnies today at BlairCandy.com! We have plenty of candy for you to fill your baskets and have some for you left over. Plus, we have wholesale Easter Candy, so if you’re organizing an event, you can get plenty to go around. Shop now and try these bunnies today! Which Flavor of Peeps Marshmallow Candy will You Try First? Peeps Delights: We’re not sure about you, but we love marshmallows dipped in chocolate! Peeps took advantage of this combination to make their Peeps Delights candy. Each package has three Peep chicks that have been dipped in either chocolate or cream. Try either the coconut or strawberry flavors for a delightful treat. Peeps Large Bunnies: Making an Easter basket for someone who isn’t a fan of chocolate bunnies? Substitute it for a Peeps Bunny! These large bunnies are dressed for the occasion with a big bowtie and have brought along a carrot to snack on! These also look (and taste) great with the Peeps decorated eggs. Flavored Peeps: What’s better than the sugar on a fluffy Peeps Marshmallow? Nothing! Peeps wanted to make sure you got plenty of that sugary goodness with these fun, flavored Peeps. Try either Sour Cherry or Party Cake for a break from the normal Easter candy selection. Ready to try some or all of these Peeps Marshmallow candy treats? Visit us at BlairCandy.com to see these, all of the classic colors, and the rest of our Easter candy selection today!